From the author of the unforgettable bestseller WE WERE LIARS comes a suspenseful new psychological thriller - the story of a young woman whose diabolical smarts are her ticket into a charmed life. But how many times can someone reinvent themselves? You be the judge. I'm a little bit OCD when it comes to numbers (well ok, maybe I'm severely OCD about numbers) so I wasn't sure how I would cope with Genuine Fraud beginning at Chapter 18. Well I was so engrossed in the story that I didn't really notice, to be honest. I just wanted to know what had happened to get to this point in time and even though I sometimes didn't know what the devil was going on, I enjoyed it a lot more than I expected. Jule and Imogen are unlikely friends but friendship doesn't see class, religion or skin colour but Jule is a fraudster and it isn't long before she turns herself into a mirror image of Imogen. It isn't long before Jule assumes Imogen's identity and starts living her life, but Imogen will turn up and put an end to all that, won't she? 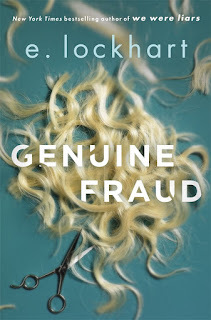 There is so much suspense in Genuine Fraud, making it a compelling addictive read. I felt so afraid for Imogen's safety early on and as time ticked backwards that feeling intensified until I had to read every single page before going to sleep. I don't know whether it was the working backwards, but I did sometimes feel a bit confused at times as to what was going on. Despite this, it held my attention enough to continue on and I wonder if perhaps we haven't seen the last of Jule...in fact I think a sequel is a must! Genuine Fraud is a quick read at less than 300 pages which is just as well as it's quite hard to put down! A super little YA read that made me look at unlikely friendships in a different light. It's true that you can never see inside someone's mind, and nor would I want to, but it's frightening to think that some people may have hidden agendas. Keep your friends close and your enemies closer...but which is which?